Short Story, now in its second year, is one to keep an eye on. The current issue, No. 4, Spring 2008, although maybe a little too southern, is excellent. It begins with “Love City” by Stephanie Dickinson, a gripping story about a teenage girl in post-Katrina New Orleans. The girl and her baby are living in a bungalow motel, where life is hard and where it’s hard to know whom to trust. Here’s an excerpt. It’s an outstanding story. The issue includes a discussion with Reid Buckley about his forthcoming memoir and also short story by Scottie Fitzgerald that is more notable (in my opinion) as a historical document than a story. The issue concludes with “The Good Fight” by Rosa Shand, about a Columbia, South Carolina woman who decides to stay on her summer home in the mountains. 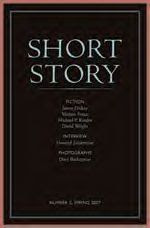 Of note also is the announcement on the Short Story website that the magazine is beginning a weekly short story podcast beginning in September. That sounds like a worthy effort and I look forward to hearing more.